← By Way of an Introduction…. “Don’t Blink. Blink and you’re dead. Don’t turn your back. Don’t look away. And don’t Blink. Good Luck.” So goes the message the Doctor gives to Sally Sparrow in the Doctor Who episode “Blink.” An episode which sparked what is arguably the most iconic line in Doctor Who’s 50 glorious years, “the angles have the phone box.” Larry Nightingale, in turn, quips “I’ve got that on a t-shirt,” which from a merchandising standpoint is absolute genius (I know I have a “the angels have the phone box” shirt). Love it. But they hadn’t made any references to “Blink.” The fans, of course, all had a field day. Angels? 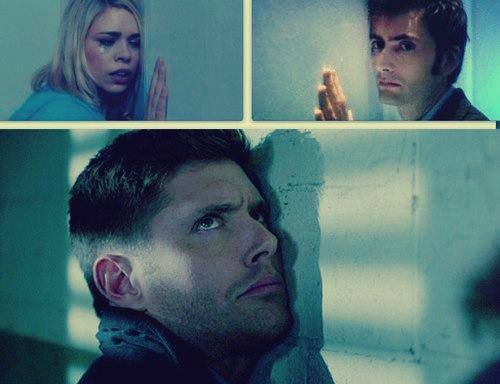 Those are in both Doctor Who and Supernatural. 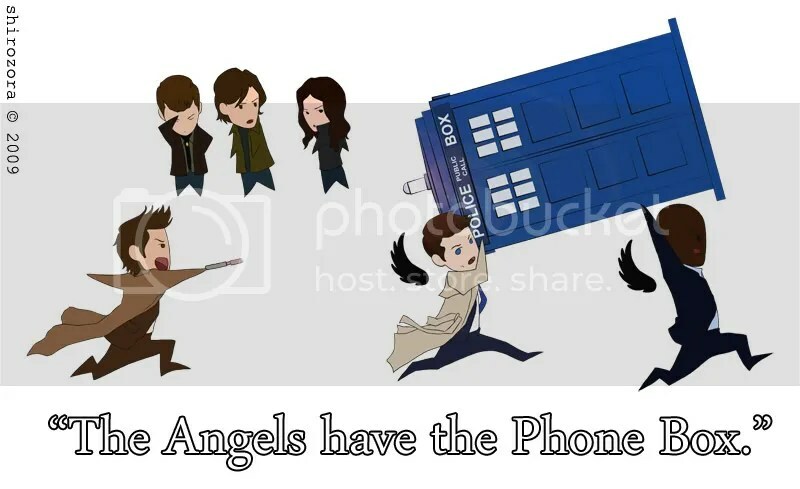 Just type THE ANGELS HAVE THE PHONE BOX SUPERNATURAL into Google images. Anyway, Jensen Ackles really wanted to play cowboys and talked the writers into making an episode where he, as Dean, and Sam (time) travel back to the old west. It was not the first time that time travel had been used in the show, but it was the only time that the Winchesters had willingly traveled to a time before the invention of rock ‘n’ roll (a.k.a. Dean did not mean to get trapped in the 1940’s in “Time After Time After Time”). And they do so via angel powers. So to recap, Castiel, an angel, zaps the Winchesters back to another time period. Well, all right that’s a little Blink-ish, I suppose. Moving on. Dean: I’ll stay here, hook up with the posse. Dean: Because you know me, I’m a posse magnet. I mean, I love posse. Dean: Make that into a T-shirt. Call the Warner Brothers shop, tell them we need a a new t-shirt screen printed. Alright, admittedly they don’t sell them at the Warner Brothers shop, but they’re really easy to find. Near the end of “Frontierland,” Cas (I heard they spell it “Cass” in the scripts, but it’s derivative of “Castiel,” which has only got one “s”, so I don’t know why) brings Sam and Dean back, but they were unable to retrieve the phoenix ash they went back for in the first place. Maybe if Dean hadn’t been making (excellent and absolutely called for) Die Hard references that wouldn’t be the case. But at the end, a postman delivers a package that had been sitting in the post office for decades and decades from Samuel Colt and it contains just the ash they needed. Huh. Sally gets a letter in the present from someone she knows who’s in the past, delivered right to the house where she is, but doesn’t live. That’s all very familiar. So I think, I think, that Frontierland was a Supernatural remake of “Blink.” They do that a lot on the show, especially with X-files episodes; “Tall Tales” is “Bad Blood” (but not as good), “Mystery Spot” is “Monday” (but better). And to clarify, this isn’t something I hold against them at all. It’s simply an observation. And I couldn’t find anyone else out there who made the connection between “Blink” and “Frontierland.” Nor do I wish to compare them, as I falsely advertised in the title (“Blink” is better. On the whole, Doctor Who is better too, though I love both dearly). But then again, I’m probably just reading too much into it. This entry was posted in tv and tagged angels, blink, castiel, dean, doctor who, frontierland, phonebox, sam, supernatural, tardis, the doctor. Bookmark the permalink.